1. Match listed basic admission requirements with your test scores, GPA, and essays. 2. Request actual average enrolled student statistics. These may vary greatly from basic (minimum) requirements. Honors websites have begun to list actual mean scores more frequently, but if they don’t here’s a tip: In general, honors students will have average test scores 6-10% higher than the 25th percentile of accepted students for the university as a whole. The 25th percentile scores are available from U.S. News and other sources. If there is a wide gap between the basic and average stats, and your stats are much closer to the basic stats, then you can probably find a better option. That said, if the admissions requirements are more holistic and less stats-driven, you may be fine. 3. Determine the size of the honors program (mean size in major public universities is ~1,700, but programs may be as small as 140 or as large as 9,000). 5. Assess the quality of the city, surrounding area, and climate. Does your student value a dramatic change of scenery or atmosphere, or special recreational options, either on campus or nearby? Is the campus safe? The city itself? What are the “town-gown” relations? Some college towns that would seem to be isolated are actually especially supportive of students. How about convenience and cost of travel to and from your hometown? 6. Determine the curriculum requirements as a percentage of graduation requirements. Generally, the number of honors hours should be at least 25% of the total required for graduation. There is a trend in honors education to allow more “co-curricular” experiences to count toward honors completion. These experiences may include group projects, leadership training, volunteer activities, internships, or travel options. Decide whether you want a traditional course-based program, a blend of traditional and co-curricular, or an emphasis on the the latter. If you are planning to study engineering, decide whether the university honors program would take too much time given your demanding major requirements. Many programs, however, have fully integrated options that work well for engineering majors as well as living/learning facilities for engineering students. The engineering school might have its own honors track, which could be a better choice for some. Engineering majors who are honors students are more likely to graduate with better overall communication skills and more breadth and depth in their course work. 7. Determine the number of honors sections per semester/quarter. Sometimes honors websites give you an idea, but the actual number could differ. 8. Evaluate the reputation of the university in preferred or likely areas of study. 10. Ask about staff size, the number of advisers, and availability to students, as well as special freshmen orientation programs. Honors advising is extremely important. 2. 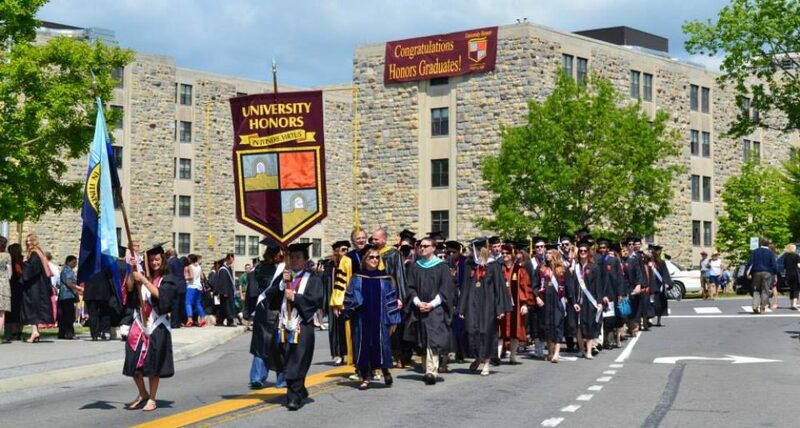 Ask about the types of honors sections: all-honors seminars; all-honors sections in a specific discipline offered by honors or a department; “mixed” sections of honors and non-honors students; and the percentage of honors contract/option/conversion courses per average student at time of graduation. Also consider the “experiential” courses (see below) and options, being sure to understand their role in the curriculum. Mixed sections may be small or, more often, large sections that can have more than 100 total students in 3-4 credit hour courses. Of these students, maybe 10-20 could be honors students, who then meet for one hour a week (rarely, two hours a week) in separate “discussion” or “recitation” or “add-on” sections. These sections can be led by tenured professors but are typically led by adjunct faculty or graduate students. Ask how many sections are mixed, and of these, ask how many of the main section classes are large. Contract courses are regular–and often larger–sections with both honors and non-honors students, mostly the latter, in which honors student do extra work or have periodic individual meetings with instructors. While most programs have some contract courses, they are generally more prevalent in large honors colleges and programs. There are advantages and disadvantages associated with contract courses. They can speed graduation, offer more flexibility, expand the influence of honors in the university as a whole, and foster contacts with mentoring faculty. But their quality and size may vary significantly. Experiential courses are something of a trend in honors education. Some are service-oriented (think volunteering, community service) and some are related to developing leadership skills or practical knowledge through internships. Experiential courses can be exciting, broadening, and influential. They can also be time-consuming, and some do not offer course credits. It is wise to check out this aspect of an honors curriculum and take care in judging your commitment. 3. Ask about tuition discounts, scholarships, continuing financial aid, including special recruitment of national merit scholars. Some programs offer in-state tuition to out-of-state honors students, or equivalent discounts. 4. Determine if there is priority registration for honors students and, if so, type of priority registration. Sometimes honors students register with the seniors, or the first groups to register, or with the class ahead. Some programs have no priority registration. 5. Research the types of special honors housing for freshmen and upperclassmen, if any, including basic floor plans, on-site laundry, suite or corridor-style rooms, air-conditioning, location of nearest dining hall, proximity of major classroom buildings (especially in preferred disciplines), and availability of shuttles and other transportation on campus. If there is no special honors housing, it is often a sign that the honors program does not want to foster an elitist atmosphere. The absence of priority registration may be an additional sign. 6. Research the study-abroad opportunities; some universities have a separate division for study-abroad programs or even separate honors study abroad programs. 7. Ask about the presence and involvement of advisers for prestigious scholarships, such as Goldwater, Rhodes, Marshall, Truman, etc., and program success in achieving these awards. Some honors colleges have special staff dedicated to preparing and mentoring candidates for these awards. 9. Now, try to assess the quality of the honors program versus quality of university as a whole. Is the honors program a “value added” feature? This step requires some knowledge of honors program ratings. Do honors grads gain entrance to strong graduate and professional schools, or find ready employment?